What Credit Repair Cloud Triggers and Actions are Supported? New Client - Triggered when you add a new client. New Lead - Triggered when you add a new lead. Update Client - Triggered when you update a client. Update Lead - Triggered when you update a lead. Status Change - Triggered when you convert status from client to any other status or from any other status to client. New Invoice - Triggered when you add a new invoice. Create Invoice - Adds a new invoice to client. Create Client - Adds a new client. Create Lead - Adds a new lead. Change Lead - Updates a lead. Change Client - Updates a client. 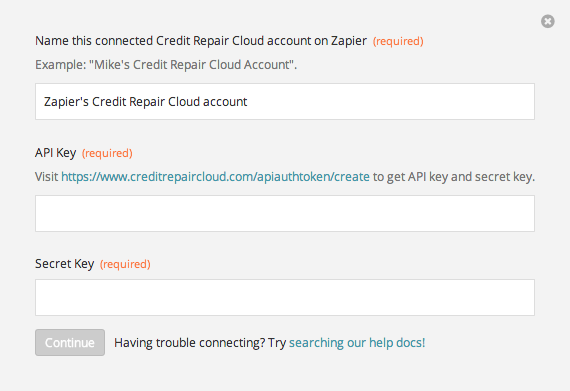 To get started with Credit Repair Cloud, first click to add a Credit Repair Cloud account to Zapier to be used in your zap. Next, you'll be asked for your Credit Repair Cloud API Key and Secret Key. To find those keys, you'll first want to log into your account and then head here: https://www.creditrepaircloud.com/webapi/apicredentials. You can then copy those keys and paste them into Zapier.